After nearly half a century of service, Ross Allen is like family at Geelong's Tuckers Funeral and Bereavement Services. 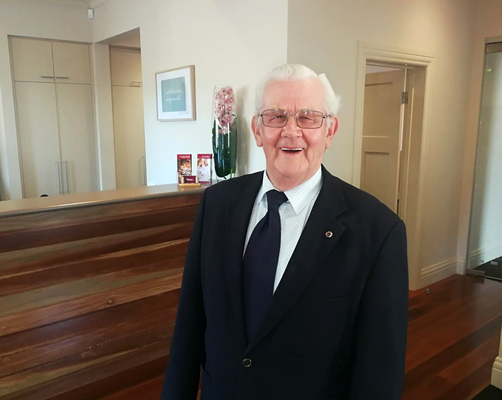 After 46 years with Tuckers Funeral and Bereavement Service, Ross Allen is well-known throughout greater Geelong for his community involvement and his commitment to providing care and support to families who experience loss. A question-and-answer session with Ross reveals his passion and dedication, particularly when it comes to the care of the families he assists. “Working as a licensed grocer, I managed a mixed business with my father for over 15 years. “After a few years of my father having health problems, we decided to sell the business. It was then that Trevor Cole offered me an opportunity to work at Tuckers. Tell us about your job. What is the primary role of a funeral director? “Each day can be so different. Meeting with families and being invited into their lives at a most difficult time is a privilege that to this day is just as important as it was 46 years ago. “There is quite a lot involved behind the scenes organizing each funeral. From the initial meeting with the family to the day of the service, my focus is on providing all the support I can. Over the past 46 years, what particular memories that have stayed with you? What do you think has changed the most in the funeral industry over the years? “If I think back to when I first started in this industry to now, one of the biggest changes is how funerals have evolved. What should people know when planning ahead? “These conversations can sometimes be difficult for families to have. “For some people who purchase a pre-paid funeral it’s about taking away the burden of leaving the cost to their family, for others it forms part of their estate planning. “It’s also about how you want to be remembered, your favorite song, verse or story you would like told. We often see family members not knowing what kind of service to have for their loved one. Forty-six years is a lifetime of service, what keeps you passionate about what you do? “Caring for people at a vulnerable and challenging time, helping them with the decision making and providing support gives such great personal satisfaction. To know I have in some way contributed to making that day everything they wanted is very important to me. What other activities do you do outside of Tuckers? “I’ve been actively involved in church leadership for over 50 years and a working member of Rotary for 30 years, being president in 1984 with an honor of being recognized as a Paul Harris Fellow. Do you have any tips and advice for anyone interested in becoming a funeral director? “A genuine concern and compassion for people are such important qualities but, most importantly, being attentive to families and their needs. It doesn’t matter how busy you are or what else may be happening, when working with a family give them your undivided attention.